China, Russia Mounting Growing Challenge to US in Africa - Integration Through Media ....! (VOA): China and Russia are working to expand their influence across Africa, hoping to outspend or out-compete the United States, U.S. officials warn, describing it as part of a larger effort by both countries to reshape the world order. For months, top national security officials have been talking about the reemergence of what they describe as a great power competition, calling out China and Russia as the two countries doing the most to counter the United States. Officials say the efforts by Beijing and Moscow are both regional and global, with both pursuing strategies to deny the U.S. access to conflict zones in times of crisis and to commercial markets in times of peace. And in Africa, both are trying to portray themselves as viable, if not essential, alternatives to the United States. On Tuesday, the commander of U.S. forces in Africa told lawmakers it is now critical for African countries to know Washington can and will remain a steadfast partner. "It's important that we're there, that we're present and that the African people see our commitment," U.S. Africa Command’s Gen. Thomas Waldhauser told the House Armed Services Committee. China's expanding influence Concerns about China’s ever-expanding reach into Africa are not new. U.S. intelligence warned this past September (2017) that Beijing's first overseas military base, at Doraleh, in the east African nation of Djibouti, was likely to be the first of many. “China seeks to build [military bases] around the world, creating new areas of intersecting, and potentially conflicting, security interests between China and the United States,” an intelligence official said at the time. For U.S. Africa Command, perhaps no situation is as concerning as the one in Djibouti, home to Camp Lemonnier, the only permanent U.S. military installation on the African continent and a hub for U.S. counterterror operations. Gen. Waldhauser described the Chinese military base at Doraleh as, “right outside our gates.” And despite some efforts to work with the Chinese, in areas like medical aid and training, U.S. defense officials remain wary. “We are not naïve,” said Waldhauser Tuesday. "We are taking significant steps on the counterintelligence side so that we have all the defenses that we need." But China’s military might in Africa, including its approximately 2,500 peacekeepers, is not what has U.S. defense, intelligence and diplomatic officials most concerned. Rather, they point to the way Beijing relies on economic aid and promises of development to bring countries like Djibouti into its sphere of influence. “The Chinese there are building facilities. They're building a shopping mall. They built a soccer stadium," Waldhauser said. "They built the infrastructure for communications in Djibouti.” “When we talk about influence and access, this is a classic example,” he added. “We’ll never outspend the Chinese.” U.S. Secretary of State Rex Tillerson on Tuesday went as far as to accuse China of "encouraging dependency" in its approach to the continent. WATCH: Tillerson Touts Africa As Key to Global Security “Chinese investment does have the potential to address Africa's infrastructure gap but its approach has led to mounting debt and few, if any, jobs in most countries. When coupled with the political and fiscal pressure, this endangers Africa's natural resources and its long-term economic, political stability,” noted Tillerson in a speech hours before leaving on a five-country African trip. Other U.S. officials have also raised concerns about the high levels of debt some nations are incurring as they increasingly accept Chinese loans. By some U.S. estimates, Djibouti, which is home to the U.S. military base, owes more than $1.2 billion to Beijing. 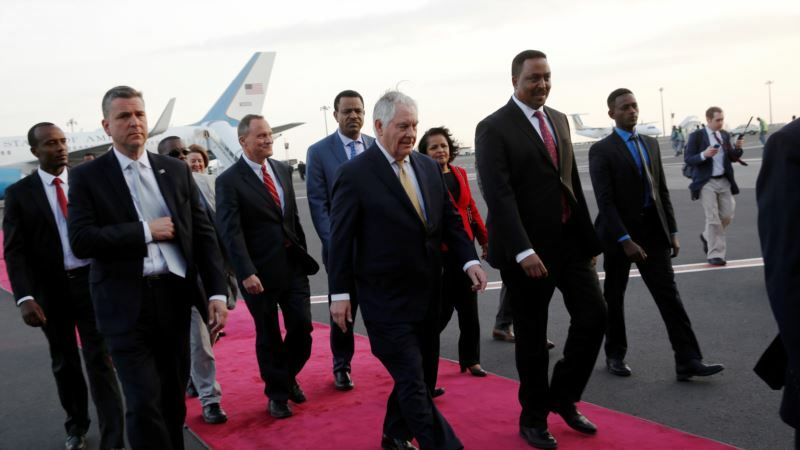 That has sparked fears among some U.S. lawmakers that China could make a play to take control of Djibouti’s key port, the Doraleh Container Terminal. Djibouti took control of the port citing a contract dispute with the former operator, Dubai-based DP World. “Reports that I've read say that they didn't seize it for purposes of operating it for profit, but that they actually intend to gift it to China,” Republican Representative Bradley Byrne (from Louisiana) said during Tuesday's hearing with Africa Command’s Gen. Waldhauser. “The Chinese aren't there for purely charitable reasons,” Byrne said. “We all would recognize that.” U.S. defense officials admit that if China does take over the port and decides to impose any restrictions, the consequences could be significant – impacting the military’s ability to refuel ships and to resupply Camp Lemonnier and other outposts across Africa. Russia's focus on Africa Russia, too, is making Africa more of a focus. Russian Foreign Minister Sergey Lavrov visits Africa this week, starting with a stop in Zimbabwe, where Moscow has been cultivating economic ties, including a $3 billion investment in platinum mining, while also pursuing deeper military ties. There has also been extensive Russian outreach to northern African nations, particularly countries like Libya which border on the Mediterranean. “Our concern would be their ability to influence and be on the southern flank of NATO, and also them to kind of squeeze us out, if you will, by them taking a prominent role,” said U.S. Africa Command’s Waldhauser. Russian officials say they have no plans to back down. “African countries view the development of cooperation in the military and technical sphere as an instrument of ensuring their sovereignty, independence and countering the pressure of Western countries,” Andrei Kemarksy, director of the Russian Foreign Ministry’s Africa Department told the Tass news agency last month. “We are training both military and police personnel for peacekeeping operations,” Kemarksy added.